Trio offers an exotic fusion of precious metal finishes. Rose and yellow gold highlights attune perfectly with sterling silver and diamonds to deliver a truly exquisite suite. 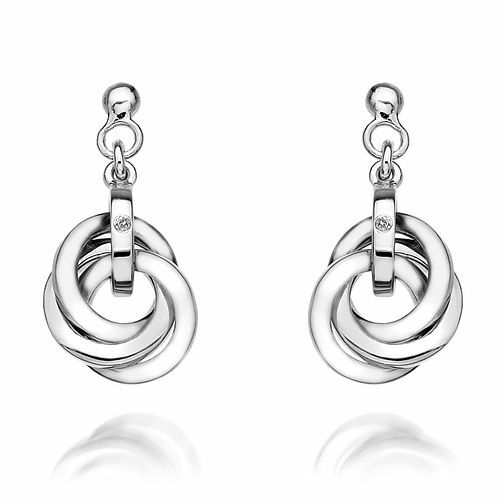 These Trio earrings, measuring 13mm in height, feature a cluster of interlocking hoops that hang delicately with a silver band which adorned with a real one point diamond. Hot Diamonds Silver Trio Earrings is rated 4.0 out of 5 by 1. Rated 4 out of 5 by Anonymous from Good product Bought as part of my wife's Christmas - she is very happy with earrings !